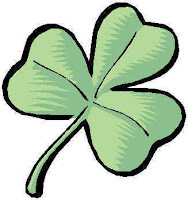 If you reside 3.2km from the nearest Gaelscoil you may be entitled to school transport – to apply you must register online with Bus Eireann School transport before 30th March 2012. Details on how to register for the 2012/2013 school year are available on the PA section of the school web site. Cosúil le gach scoil sa tír (ar domhain, is dócha!) ó am go chéile bíonn cásanna míoltóga gruaige i ranganna éagsúla. Tá sé an-deacair fáilt réidh leo muna bhféachann gach clann ar gruaig a bpáistí féin. Tá míolta gruaige i dhá rang ach go háirithe nachmór ó thosach na mbliaina. Tá sé an-deacair leanúint ar aghaidh ag cur leigheas orthu agus fáilt réidh leo agus ansin iad a fheiscint arís cúpla seachtain níos déanaí. Táim ag iarraidh anois ar gach uile theaghlach gruaig na bpáistí a scrúdú le haghaidh míoltóige gruaige, leigheas a cur orthu más gá agus an foirm seo a sheoladh ar ais ina dhiaidh ionas go bhfuilimid cinnte go bhfuil sé déanta ag gach teaglach sa scoil. Táim ag ceapadh oíche amárach, Dé Céadaoin an 29ú Feabhra chun é seo a dhéanamh. Ní bheidh aon obair bhaile scríofa ag na páistí chun am ceart a thabhairt daoibh é seo a dhéanamh. Nuair atá sé déanta sínigh an fhoirm agus seol ar ais é le bhut dtola. Beimíd ag lorg gach uile ceann ar ais mar sin seol ar ais ar an Déardaoin. Táim ag impí oraibh seo a dhéanamh chun deireadh ceart a cur leo ar deireadh thiar thall. Muna gcríochnaíonn é seo an fhadhb beidh orainn gruaig na bpáistí a scrúdú ar scoil agus deileáil leis sa tslí sin. Rud nach bhfuil ag teastáil ó éinne táim cinnte. Like every school in the country (in the world, I suppose!) there are sometimes cases of head lice in different classes. It is very difficult to get rid of them if each family doesn't look at their own children's hair. There are head lice, in two classes especially, almost continuously since the start of the year. It is very hard to continue treating them and getting rid of them and then to see them again a couple of weeks later. I'm now asking each household to check their children's hair for head lice, do the treatment if necessary and send back this form afterwards so that we can be sure that every household in the school has done it. I am planning it for tomorrow evening, Wednesday the 29th February. The children won't have any written homework to give you time to do this. When it is done, sign the form and send it back please. We will be looking for each one to come back on Thursday. I am imploring you to do this to finally put a definite end to them. If this does not end the problem we will have to examine the children's hair at school and deal with it in that way. Something nobody wants, I'm sure. Scrúdaigh mé gruaig mo pháistí go léir le haghaidh míoltóga gruaige agus chuir mé an leigheas orthu. I examined all my children's hair for head lice and have treated them for same if necessary. Aon duine NÁR sheol na stubs ticéidí Spóirt na Cathrach thar nais chuig na scoile, seol thar nais ANOIS DÍREACH iad leis an €2 le bhur dtola. Ba cheart go mbeadh ceann i gcóir gach páiste sa scoil.Anyone who hasn't done so, please send back the Cork City Sports ticket stubs NOW with the €2. There should be one for each child in the school. 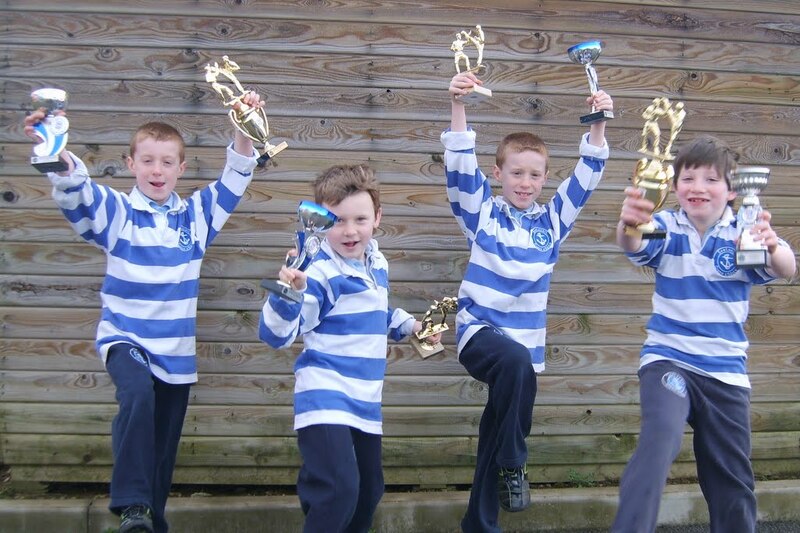 Click here Green-Schools in Ireland February E-zine! Tuismitheoirí 1,2 & 3 Bíodh na héadaí a chaith na páistí do dráma na Nollag acu ar an Luan le bhur dtola. Táimíd chun cur isteach ar Féile Dhrámaíochta na Mumhan agus tá moltóirí ag teacht anuas chun féachaint orthu an tseachtain seo. The children will need the clothes, props etc they used for the Christmas dramas on Monday as we are hoping to enter into the Munster Drama Festival. A judge from the committee will be coming to the school this week to see if we will be eligible to participate. Go n-eirí linn! Bíodh deireadh seachtain deas agaibh! The minutes from the Parents Association meeting on Monday 20th February 2012 are now available on the school website under the PA section. We are looking for people to bake for the Cake Sale / Coffee Morning that is taking place on Friday 9th of March at the Temperance Hall. 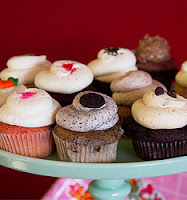 You can drop your cakes off at the Temperance Hall after 9, or there will be someone at the Scoil from 8:30am to collect your cakes. We are hoping this will be a great social event for the Scoil, and for the town of Kinsale so see you all there! Please note – the start time for the first Kinsale Pink Ribbon Walk on Sunday 4th March has been changed to 12 noon to accommodate the rescheduled Ireland V France rugby international, as many participants and volunteers were keen to do both! Please check in on Saturday 3rd March at the Temperance Hall from 12noon-7pm if you live in Kinsale, to collect your number, t-shirt and hand in sponsorship money. Otherwise there is Check-in on Sunday 4th March 9am-11.30am at the Temperance Hall, Kinsale. Grianghraif nua / New photographs on the school web site! Congratulations to all our Tae Kwon Do Prizewinners at the The Scion Open International Tae Kwon Do Competition, Little Island Sports Complex on Sunday 19th February 2012. Instructor: Liam Corkery, Daidí Seán agus Eve. 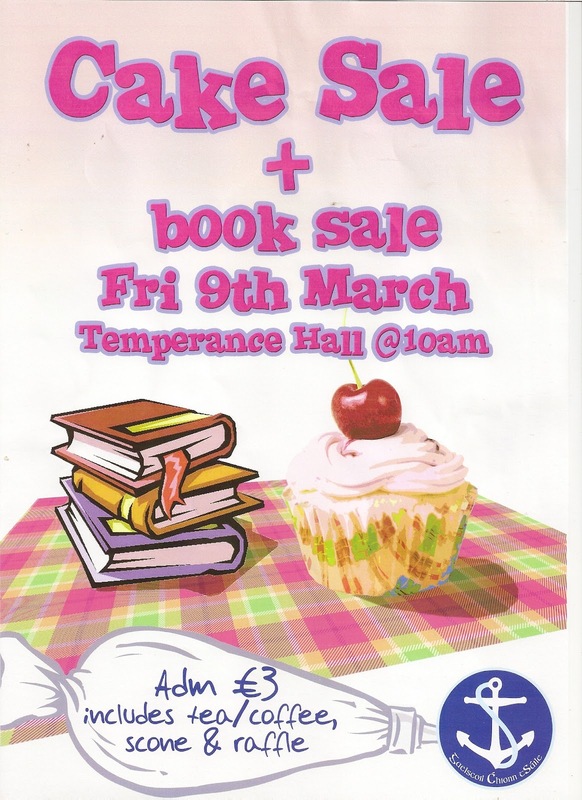 We need good quality books for the Book Sale / Coffee Morning that is taking place in the Temperance Hall on Friday, March 9th. A box has been placed inside the door of the scoil for all book contributions. Fáilte romhaibh go léir thar nais! Tá súil agam go raibh briseadh deas ag gach éinne. Tá ticéidí Spórt na Chathrach á cur abhaile le rang Sinéad inniú ar deireadh thiar thall. Brón orm faoin moill! Meabhrúcháin leis na teaghlaigh eile na stubs a cur thar nais chomh luath agus is féidir leis an €2. 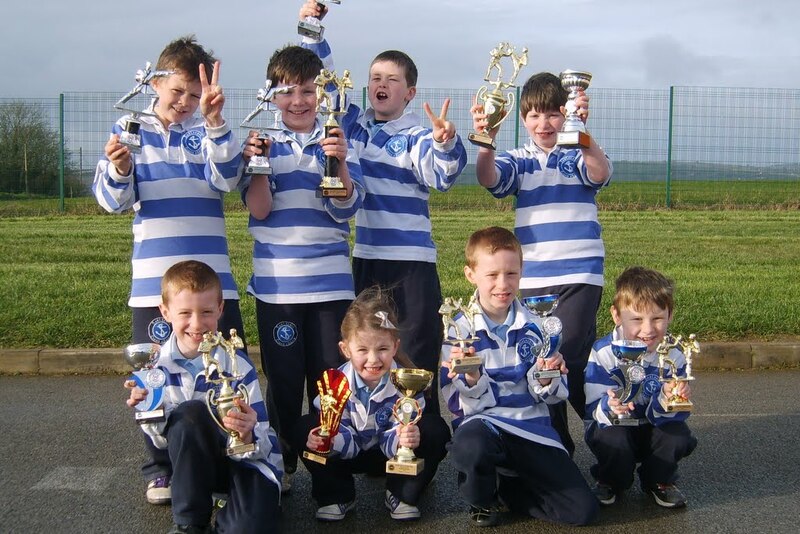 Thosaigh na páistí Rince Gaelach inniú leis an Múinteoir Miah ar feadh 10 seachtaine. Bhaineadar go léir an-taitneamh as. Welcome back everyone! I hope everyone had a nice break. The City Sports tickets for Sinéad's class will be sent home today at long last. I'm sorry about the delay! A reminder to the other households to send back the stubs as soon as possible with the €2. The children started Irish dancing today with Múinteoir Miah. It will continue for 10 weeks. They all enjoyed it very much. Tá miontráchtas á dhéanamh agam don bhliain dheireanach ollscoile agus ba mhór dom bhur gcuid cabhrach leis an suirbhé seo a líonadh. Is ceistneoir é maidir leis na cláir Ghaeilge a bhíonn ar theilifís RTÉ (cláir i nGaeilge amháin agus cláir dhátheangach) agus ní thógfaidh sé ach 10 nóiméad chun é a líonadh. Dá mbeadh sibh in ann é a chríochnú roimh an gCéadaoin seo chugainn (22.02.12) bheinn thar a bheith buíoch agus ná bíodh drogall ar bith é a scaipeadh ar bhur gcairde féin. Is suirbhé saghas trialach atá ann, má tá aon mholtaí agaibh maidir leis, is é mo sheoladh ríomphoist ná u.mccarthy1@nuigalway.ie. Lean an nasc thíos chun é a líonadh. Well it's February 2012…. and we've just finished putting together some great pictures and stories . They're all related to the Team Hope Christmas Shoebox Appeal that you worked so hard to help make a reality for so many needy children across Africa & Eastern Europe! We've seen such joy and excitement from distributions that we wanted to share it with you. Just click on the pictures, take a look and maybe download this special report. Don't forget that Team Hope run projects all year 'round to help those in greater need…. And we could always use your help with fund raising too !!! Watch 90 seconds of absolute Joy and Excitement, kids in Burundi receiving their Team Hope Shoebox gifts. Will everyone who is interested in the Gaelscoil Gardening Club please meet at the scoil on Saturday 18th Feb at 10 am. Tea and Biscuist for all volunteers!! Book covering at the scoil on Wed. 15th of February 7pm . There are lots of books to cover so please volunteer. Bring your own scissors! Táimid ag cur tús leis an "sos torthaí" arís ag tacú leis an bpolasaí lón slántúil. Is éard atá i gceist ann ná go mbeidh sos 5 nóiméad ag na leanaí ag 10 a chlog chun píosa torthaí úr a ithe - banana, úll, oráiste, caora finiúna srl. ionas go n-íosfaidh na páistí níos mó torthaí úra gach lá. Mar sin bíodh píosa torthaí (breise) ag do pháiste le n-ithe gach lá le bhur dtola. Tá am Spórt na Chathrach ag druidim chugainn chomh maith. Má theastaíonn uainn a ghlacadh inti (agus teastaíonn!) caithfimid ticéidí a cheannach. Chuireadar ticéid do gach pháiste so scoil chugainn. Táimid á cur abhaile inniú. Cur an "stubb" thar nais (líonta) le €2 chomh tapaidh agus is féidir le bhur dtola. D'éirigh linn go leoir boinn srl a bhuachaint anuraidh. B'fhéidir go n-éireoidh linn i mbliana arís. We are starting the "fruit break" again in accordance with the healthy lunch policy. 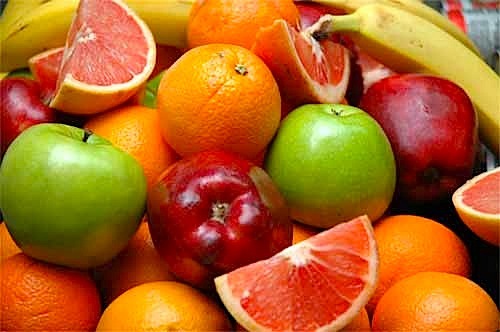 It involves a 5 minute break at 10 o' clock to eat a fresh piece of fruit - a banana, an apple, an orange, grapes etc. so that the children will eat more fresh fruit every day. So please can you give your child an (extra) piece of fresh fruit to eat every day. City Sports time is approaching us also. If we wish to take part in it (an we do!) we have to buy tickets. They sent us a ticket for every child in the school. We are sending them home today. Please send back the stubb (filled in) with €2 as fast as you can. We managed to win a lot of medals etc. last year. Maybe we will do well again this year. Bhailigh leanaí i Ranganna a haon, a dó agus a trí €380 don charthanacht 'Hands up for Haiti'. Míle buíochas do na thuismitheoirí a thug airgead dos na leanaí chun jobanna beaga a dhéanamh sa bhaile agus míle buíochas dos na leanaí a thug a airgead póca féin chomh maith. First, second and third class have collected €380 for the charity Haven Project for 'Hands up for Haiti'. Many thanks to the parents for their generous donations and also to the students who donated their own pocket money. Tá an scoil ag glacadh páirt sa mhórshiúl Lá Fhéile Pádraig. Táimid ag lorg éadach bán dara láimhe. Tabhair isteach aon sean-éadach bán nach usáidfidh sibh arís, le bhur dtola, bheadh éadach leaba go diail. 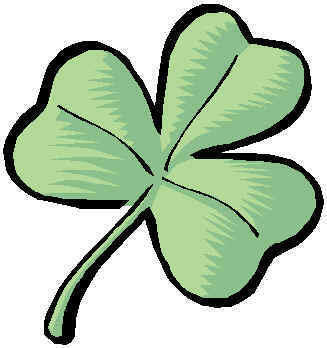 The school is partaking in the St. Patrick's Day Parade and preparations are beginning. I am looking for second hand white materials, bed sheets for example. I would be very grateful to anyone who could drop in some old white clean sheets that they no longer need. The agenda for the next PA Meeting being held on Monday 20th February 2012 is now available on the Gaelscoil Website under the PA section. All that expressed interest in Ikea orders should submit by 12th February. 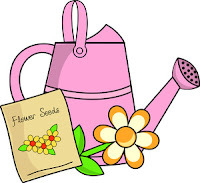 We are looking for parents to get involved in a school gardening project so that we can develop the grounds in the school and grow vegetables and flowers with the Teachers/Children involvement. All welcome please contact the PA on pa@gaelscoilchionntsaile.ie to express your interest. If you use Google Gmail you can automatically list all school events and holidays on to your own personal calendar by clicking the "+Google Calendar" icon on the bottom right side of the school calendar. The school calendar is accessible from the "Féilire / Calendar" link on the main web site. Fógra do thuismitheoirí páistí a bheidh ag glacadh pairt i Sacraimint na hAithrí (Rang 2). 'Sé an dáta atá tugtha dúinn ná Dé Céadaoin an 28ú Márta 2012 i gcóir Céad Fhaoistinn na bpáistí. Tosnóidh sé ag a 7 a chlog. Notice to the parents of children who will be going for their First Confession (Rang 2). Wednesday the 28th of March 2012 is the date we have been given for the children's First Confession. It will start at 7 pm at St John the Baptist Church. Tá Scoil nuachta ar fáil i e-mail. Cliceáil "Nuacht via email". Reminder: If you are not already receiving school news each day automatically via email click the "Nuacht via email" link on the school website to setup your subscription. Contact webmaster@gaelscoilchionntsaile.ie if you have any problems setting the alerts up. Blitz Iománaíochta ar an Aoine! Maith sibh mór le buachaillí Rang a 3 a ghlac páirt i mBlitz Iománaíochta ar an Aoine! D'imir siad go hiontach ar fad! Bhíomar an-bhródúil astu. Buíochas an-mhór le Eithne Uí Giolla Phádraig, Enda Uí Mhurchú agus Sarah Uí Chorcora a thug síobanna dos na buachaillí go dtí Áth an Mhaide chun a bheith páirteach ann. Chaith Na buachaillí ár léinte spóirt nua agus d'fhéachadar an-spóirtiúil! 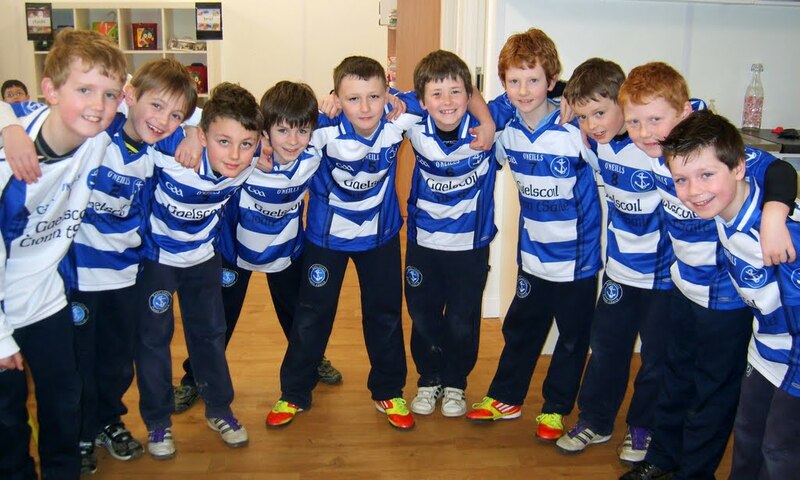 Gaelscoil Chionn tSáile abú! Well done to the boys in 3rd class who took part in the hurling blitz on Friday! They played played fantastically! We were very proud of them. A huge thanks to Eithne Uí Giolla Phádraig, Enda Uí Mhurchú agus Sarah Uí Chorcora that gave the boys lifts to Riverstick to take part there. The boys wore our new sports shirts and they looked very sporty! 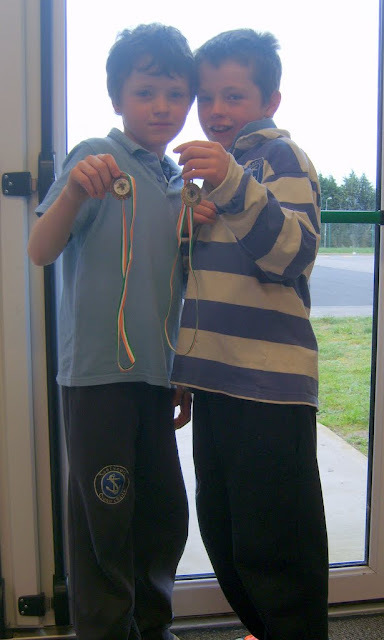 Up Gaelscoil Chionn tSáile! COMHGHAIRDEAS ARÍS A BHUACHAILLÍ – NÍOS MÓ DÚISEANNA AN DEIREADH SEACHTAIN SEO CHAITE!! Congratulations again, boys! – More prizes last weekend! 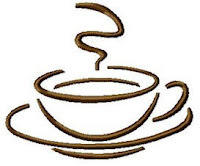 We are having a coffee morning on Friday the 9th of March in the Temperance Hall. We are hoping that this will be a great social event not only for Parents but for the community of Kinsale too. We need volunteers on the day and of course we need lots of cakes / scones / biscuits so please bake for this event. Baile Átha Cliath, Ceatharlach, Corcaigh, Luimneach, An Muileann gCearr agus Sligeach. Tá líon beag spásanna fós ar fáil; tabhair cuairt ar www.gaelchultur.com chun na cúrsaí agus na hionaid a fheiceáil agus chun cúrsa a chur in áirithe. Má tá tú féin agus cara leat ag iarraidh rang a dhéanamh le chéile, bí i dteagmháil linn agus beimid in ann praghas speisialta a thairiscint daoibh. Dublin, Carlow, Cork, Limerick, Mullingar and Sligo. There are some places still available; to view all courses and venues, and to book a place, please go to www.gaelchultur.com. If you and a friend would like to attend a class together, get in touch with us and we can offer you a special price. Ba mhaith linn páirt a ghlacadh i Mórshiúil Lá Fhéile Pádraig i mbliana agus beimíd ag lorg daltaí na scoile chun páirt a ghlacadh ann. Beimíd i dteangbháil níos giorra don am nuair atá tuilleadh eolais againn. We would like to take part in the St. Patrick's Day Parade this year in Kinsale and we will be looking for students in the school to take part in it. We will be in touch nearer the time when we have more information. Inniu lá Fhéile Blaise Naofa. Beidh beanú na scornaigh ar siúl i Séipéal an Pharóiste Naomh Sheáin inniu ag a 4 a chlog chun ceilliuradh a dhéanamh ar an lá speisialta seo. Today is the feast of St. Blaise, the patron saint of sore throats. To celebrate this there will be a special blessing at St. John's Parish Church today at 4pm. 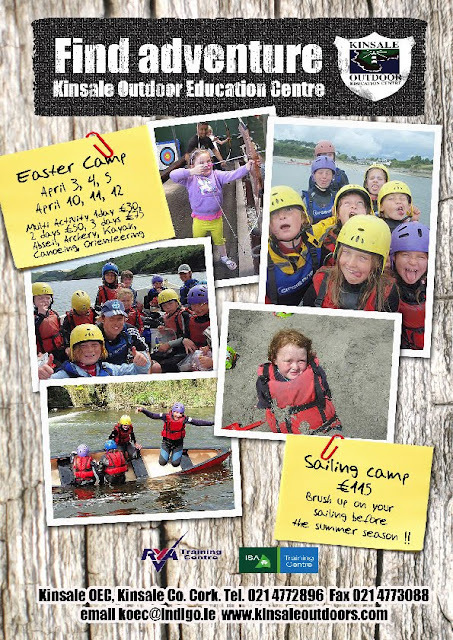 Kinsale Outdoor Education Centre (OEC) is now taking bookings for Easter Camps! Email: koec@indigo.ie or call 021-477-2896 for more information. Leabhair Léitheoireacht Naí Shóis. Junior Infants Reading Books. Fé mar is eol daoibh táimid tar éis tús a chur leis an léitheoireacht Ghaeilge le déanaí. Bíonn na leanaí ag léamh na leabhair seo ina ngrúpaí bheaga ar scoil. Níl ach 14 chóip dos na leabhar idir an dá rang naíonáin shóisearacha. Tá na leabhair seo ana chostasach agus ní féidir ach iad a cheannach ina pacaí meascaithe. Mar sin tá sé ana thabhachtach aire mhaith a thabhairt dóibh. Bímid ag obair ar na leabhair seo gach lá mar sin seol ar scoil iad gach lá. Beidh do leanbh in ann na leabhair a choimeád ar feadh dhá oíche ag tosnú amach. Tá bileog le liosta dos na leabhair a bheidh á léamh againn i filteán do linbh anocht. Sínigh an bhileog seo fé mar atáimid ag críochnú na leabhair. As you know we have recently started Irish reading.The children read these books in small groups at school. There are only 14 copies of the books between the two junior infant classes. These books are very expensive and they can only be bought in complete packets. No single book can be ordered. If one is lost 21 must be bought to replace it. Therefor it is very important to look after them. We work with these books every day so send them to school each day. Your child will be able to keep them for two nights initially. There is a sheet with a list of the books we will be reading in your child's folder tonight. Sign this sheet as your child finishes the book. It is important to look after this sheet and leave it in the folder at all times. The GaelScoil PA have sponsored a table at the pink ribbon table quiz to show our support of this worthy cause. It takes place at the Spaniard Bar on this Friday the 3rd February. We would like to extend an offer and ask if anyone would like to represent the PA on the night. We are looking for four people to run the table. Remember we only have 4 places! Win a signed copy of David Walliams's hilarious new book! Welcome to your spring Scholastic Book Fairs newsletter, crammed full of ideas to help your next Book Fair be more rewarding than ever! If you've got Scholastic Rewards to spend from your Book Fair, then you'll be glad to know that there's an even bigger range in the Scholastic Shop withover 200 new teachers' resources added for spring including Olympics resources. There's also a brand new selection of Leabhair as Gaeilge to browse. World Book Day is just around the corner on Thursday 1st March 2012. Your pupils can use their €1.50 token at the Book Fair and you can also register to watch The Biggest Book Show on Earth, an author extravaganza streamed into your classroom - live! Competitions are always a great way to excite children about the Book Fair and our current Horrible Histories competition is no exception. We've also got a signed copy of Gangsta Granny by David Walliams to give away if you can answer this question: What does Ben's granny plan to steal? Just email your answer, along with your name and postal address tobookfairs@scholastic.ie by Sunday 5th February 2012. The winning entry will be picked out of a hat.